This service teaches dogs to be polite, well-mannered members of the family who know basic commands and can be social with the family, strangers, children, and other dogs. Canine Train Tracks offers on-site individual (or family) obedience training throughout the DC Metro area. Canine Train Tracks’ obedience training uses positive, force-free methods (in contrast to traditional or dominance-based methods), mainly the technique of clicker training, originally used by trainers like Ken Ramirez to train marine mammals then pioneered for use in dog training by Karen Pryor and now used by positive trainers around the world. (See also the “Training Philosophy” page.) The trainer’s role is to demonstrate how to train a dog and to teach you how to train your own dog. An obedience training program can be as general as simply teaching basic skills (“sit”, “stay”, “come”, etc.) or as specific as you need it to be, tailored to fit your and your dog’s needs (e.g., addressing behavior problems like jumping on people or pulling on the leash). The number of sessions required for any program will depend on your goals for the training and your dog’s starting point. He will view your relationship as a collaborative learning experience, look to you for direction, and generally honor your requests. She will enjoy a stronger bond with you because obedience fosters communication between dogs who speak “dog” and humans who don’t. 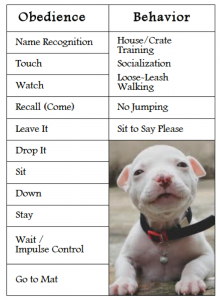 In other words, in the moments when connect – when your dog understands that “sit” means “sit”, “come” means “come,” etc., your dog will be encouraged that communication with humans is not only possible but rewarding. Obedience increases dogs’ confidence, which can help them become basically well-adapted dogs who can cope with all kinds of situations to which we humans subject them. You will help your dog learn to act in ways that are desirable rather than problematic for you. You will learn the basics of dog body language to learn to speak “dog” at least a little bit. This fosters better communication between you and your dog, but also shows respect for the dog by reciprocating the courtesy of your dog’s efforts to learn your language. The collaborative process of positive training helps foster bond and the trust between you and your dog, enhancing your human-dog relationship, which is likely one of the main reasons you decided to get a dog in the first place. The plan below is what I generally use for puppies or adult dogs who have not yet had any obedience training, such as recent rescues.